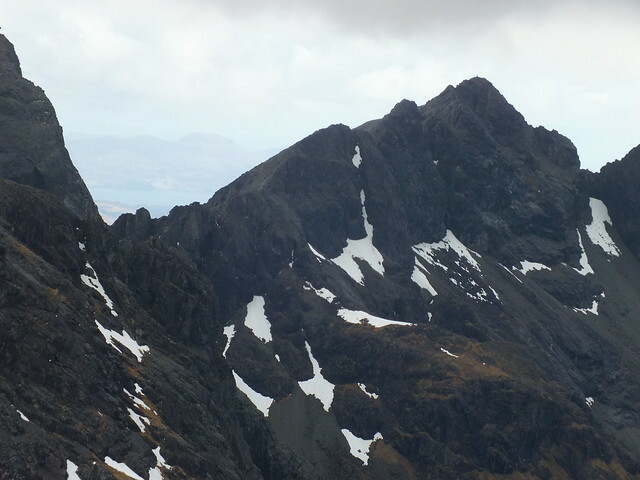 Skye day 5, what a finish! 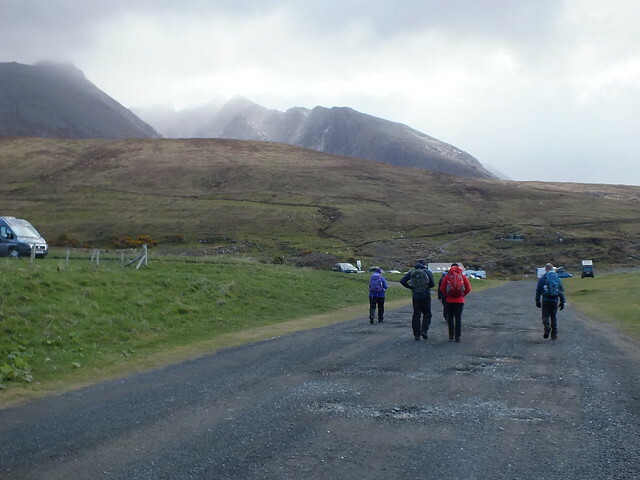 When Martin suggested that we each take a separate day for which to write a walk report, it seemed fitting to put my hand up for the “coo’s tail” report, given that I’m generally at the end of any group I may be walking with. All photo creds to Martin. It wasn't at all difficult to choose from the 350+ he made available! 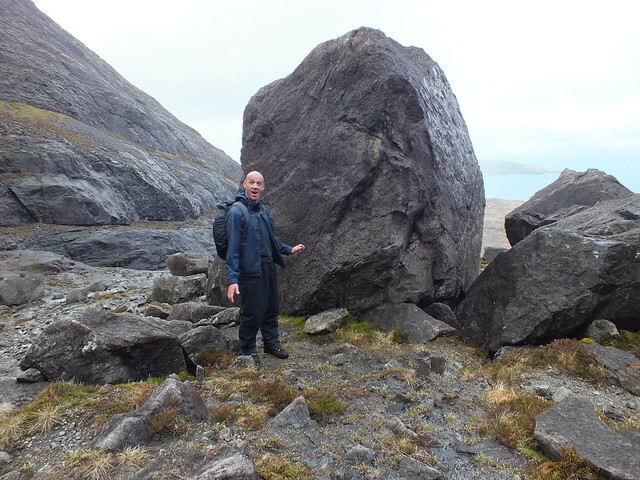 We met Paddy at the usual time, 9:00am, at the car park near the Glen Brittle campsite. The forecast was, once again, for hail, rain, snow, possible thunder, etc., etc. 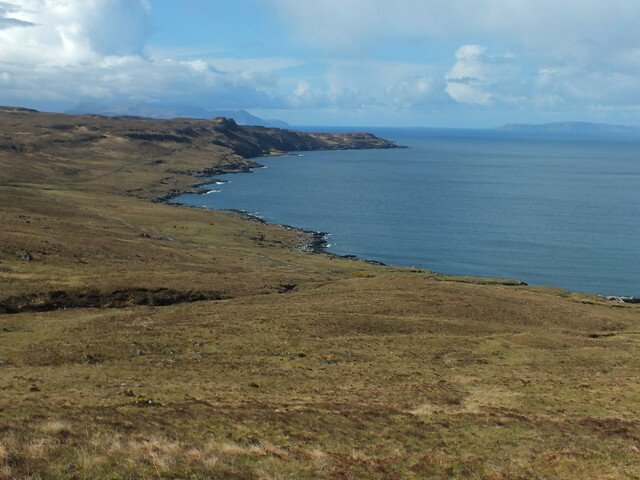 – more or less the same it had been since we arrived on Skye four days earlier. He reiterated the choice he’d mentioned to us the night before: either a short trip straight up and down Sgurr Alisdair, or Sgurr nan Eag, which was a longer walk in, and might still be the only summit we’d manage, but from which we’d have the option of carrying on to Sgurr Dubh Mor and Sgurr Alisdair if the forecast changed or proved incorrect. 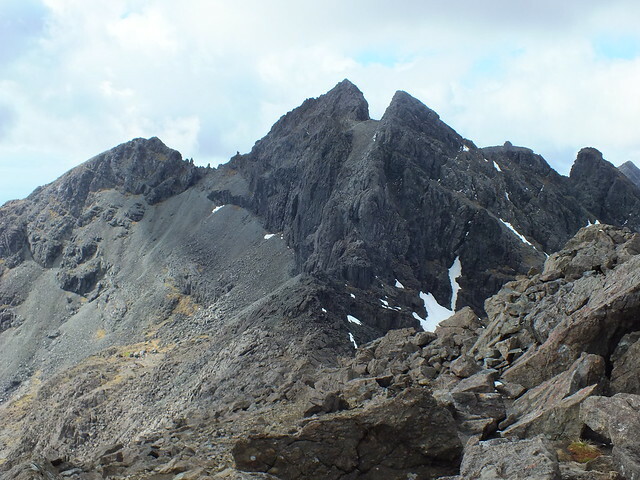 Ever hopeful, we opted for Sgurr nan Eag. We headed across the campsite and up onto the moor. 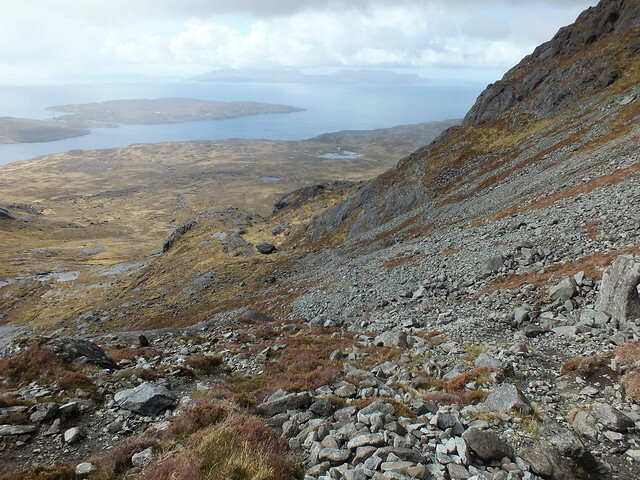 After several kilometres on a good path with a gentle ascent, and ever-improving views over Soay, and across to Canna, Rum, and Eigg, the slope steepened, and we began the climb up to Coire Ghrunnda. 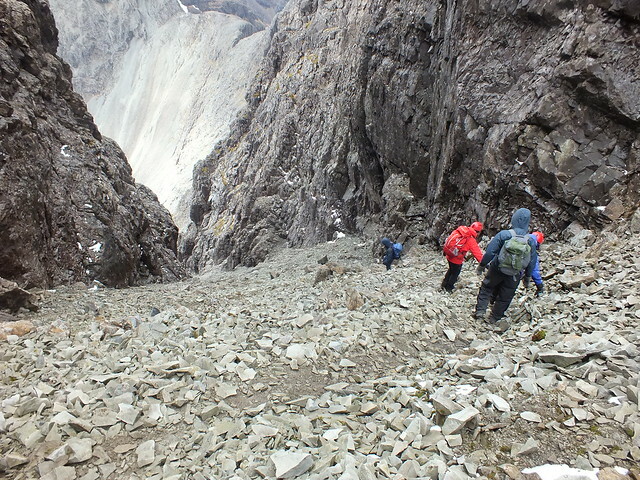 The daily ascent into the hills was getting harder, the legs getting heavier. 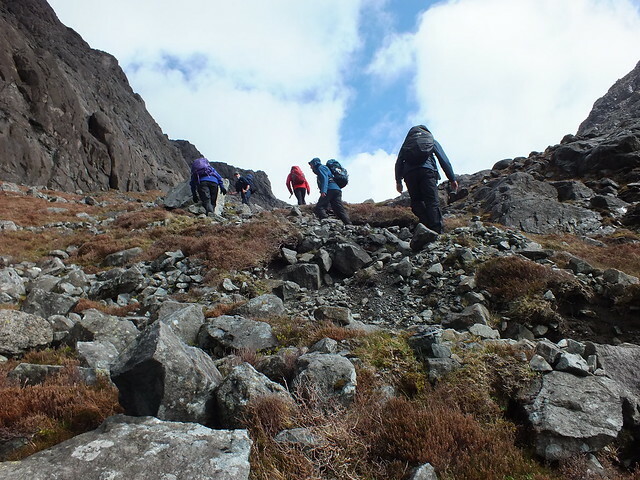 Depending on who you were, this was either the sixth or seventh consecutive day of fairly strenuous walking, more than most of us have ever done, and I gathered from the chat around me that I wasn’t the only one feeling the effects. 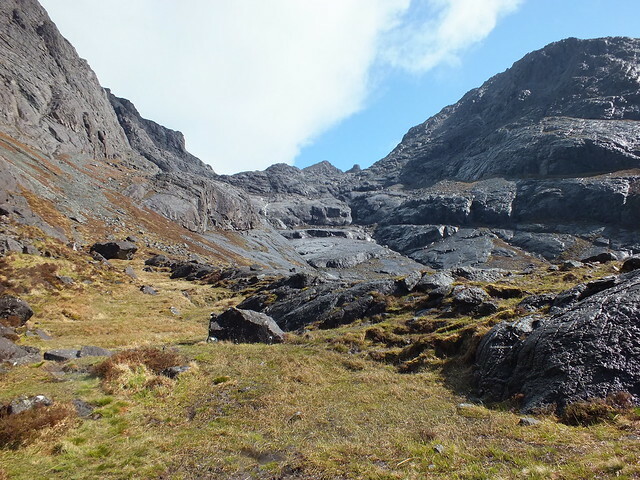 It was a relief to reach the coire and skirt around the shore of the lovely green-grey (some might even call it “candle-coloured,” yes?) 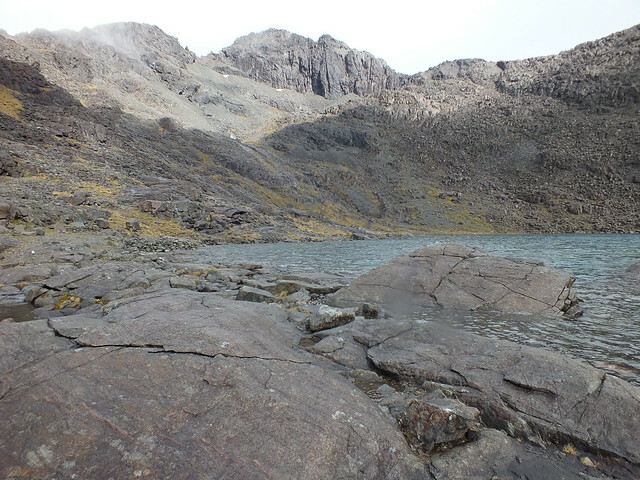 loch. First stop, lose a layer or two, maybe for the first time all week? They didn't stay off for long! The respite from “up” didn’t last long, and we continued ascending. 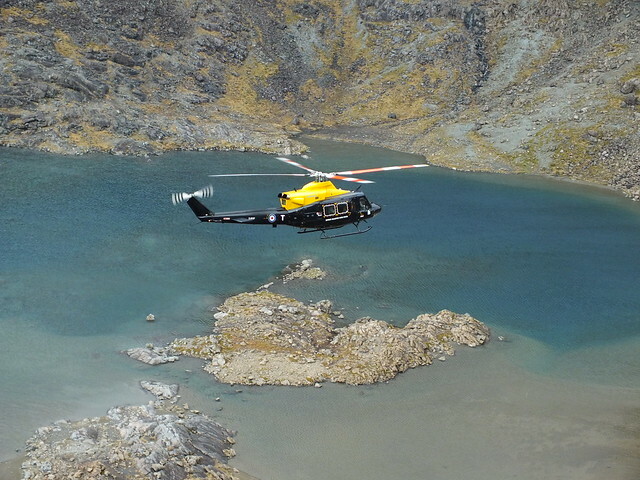 When we were about halfway up the boulder field heading toward the ridge, we heard, and then spotted a helicopter, which flew into and around the coire, back out, and then back in again. There wasn’t an obvious purpose for it being there, but it was pretty spectacular to watch. 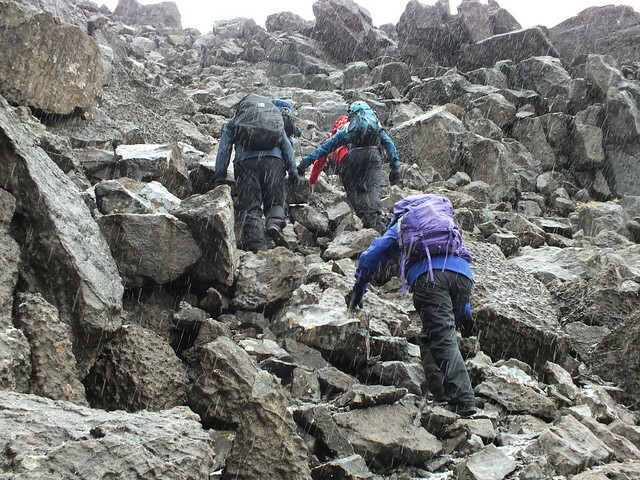 And lest you start to think that the weather gods were going easy on us, there was a brief hailstorm while we made our way up through this section as well. 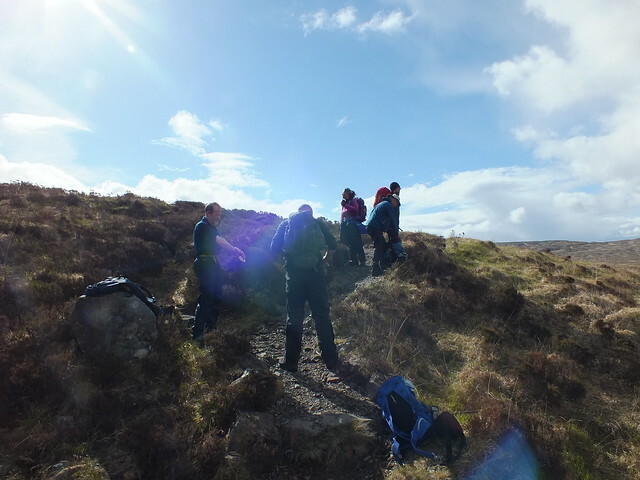 We stashed the rucksacks just below the ridge, donned helmets and carabiner belts and carried on. 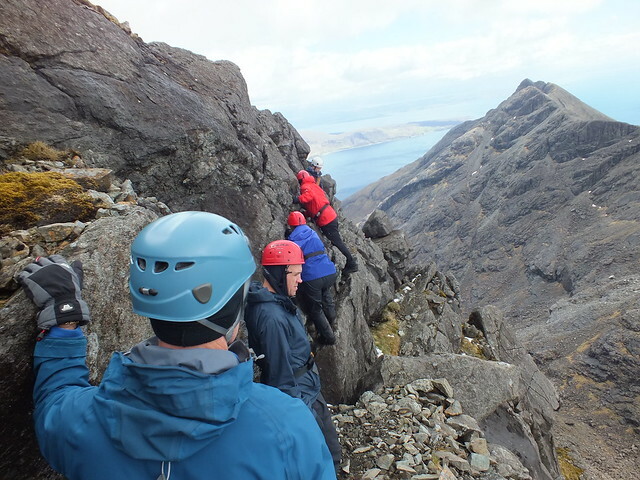 As we topped out at the ridge, the views down the other side to Loch Coruisk and Loch Scavaig, both looking impossibly turquoise, opened up far below us. 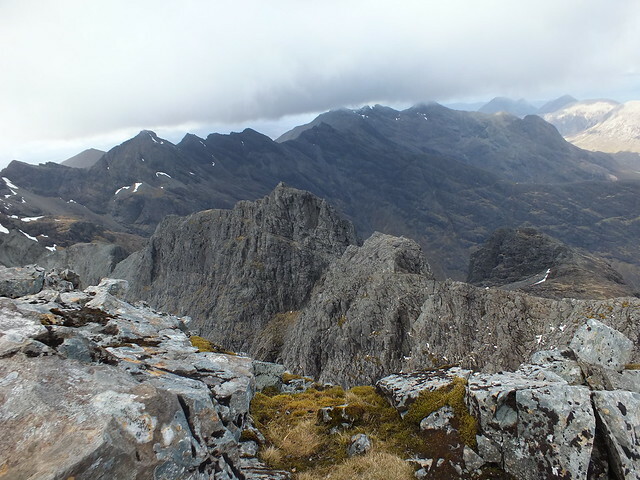 On a previous visit, I’d taken a boat trip to there from Elgol—something I’d recommend for anyone’s Skye to-do list—and I have a very clear memory of gawping up into the Cuillin and thinking how dark, foreboding, and impregnable the hills looked. It was very satisfying to be looking down onto from where I’d once looked up! 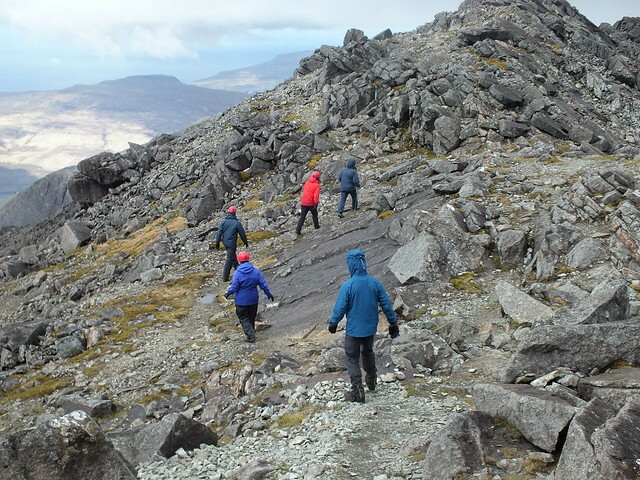 We scampered across to the summit of Sgurr nan Eag (well, it was as close to “scampering” as we were going to get). 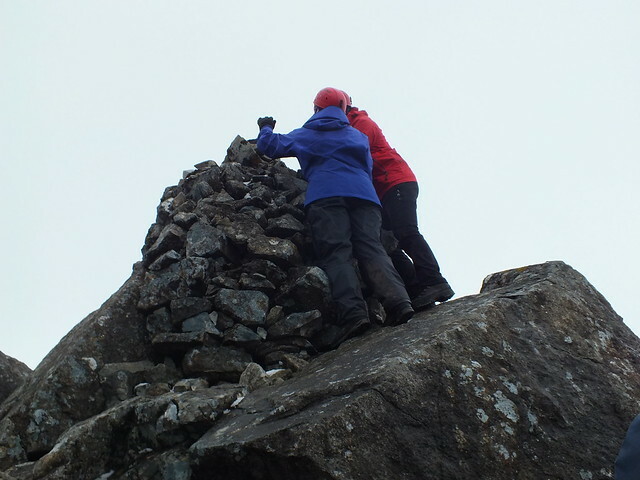 Touched the top, took our photos, and returned to pick up our things and have a bite to eat. From here, it all got more challenging, and became a bit of a blur. The weather must have been cooperating, since we did carry on, but I don’t actually remember much detail about it; I completely lost track of time as well. There was lots of up, a little bit of down, and a few very short sections more or less on the level. 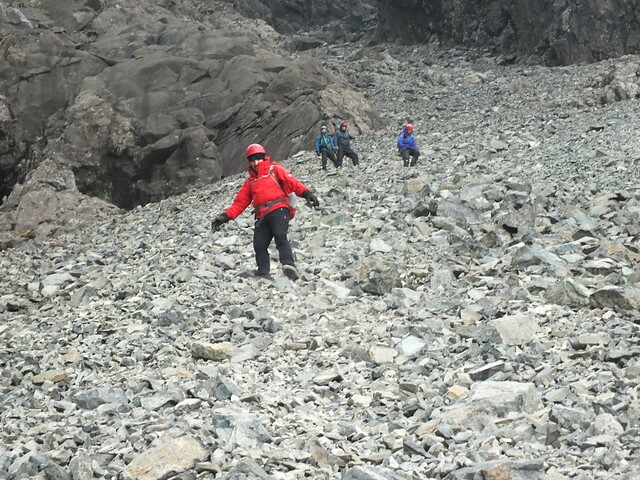 Most of the scrambling was fairly straightforward and not too exposed. Or maybe it was, but I was too busy watching either Paddy’s foot placement or my own. Concentrating hard and maintaining focus. Paddy offered the rope a couple of times, mostly to compensate for my short-leg handicap (he said, but perhaps he was just being kind), but I think there was only once when I used it that the others didn’t. It’s one thing to be able to get your foot up high enough to practically put your nose on your knee; it’s far harder to be able to push up from that position with any degree of strength! The banter and encouragement from behind were a big help over the most difficult parts. Although at one point as I was splayed across a big rock—all four limbs spread out almost as far as they could possibly go, and painfully aware of how inelegant I felt and appeared—I heard not only Martin’s camera being turned on (yeah, thanks for that, buddy), but a voice asking “Karen, what ARE you doing to that rock?” Don’t make me laugh; I’m a little busy here! Alright, Simon? Where's everyone else gone, then? Geez, some of these pics are scaring me all over again! 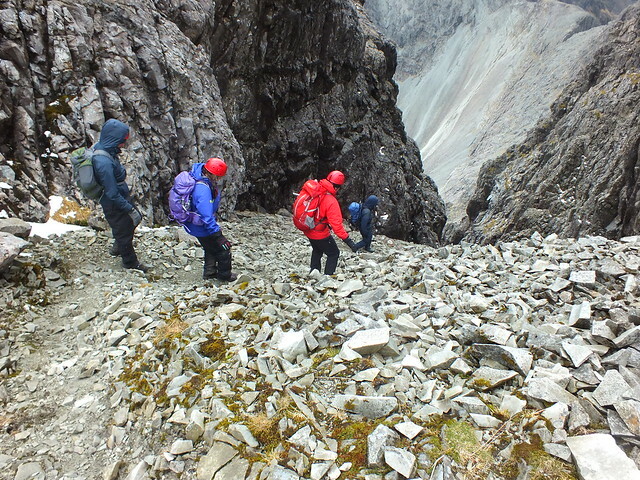 Again, we left the rucksacks somewhere below the summit of Sgurr Dubh Mor, and made our way to the summit. Touch the top, fist bumps (a gesture that none of us is really young or cool enough to pull off), photos, back down to pick up the gear. 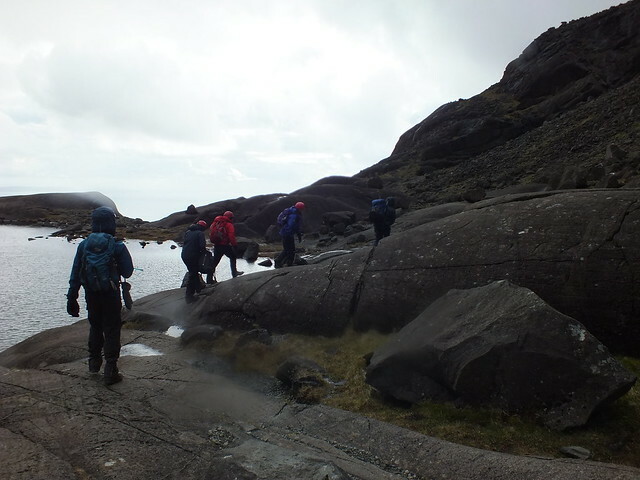 It was more of the same as we made our way over and up to Sgurr Alisdair, although this section included one bit where everyone used the rope. I found the bottom part of this little chimney to be very difficult: I just couldn’t get my right foot as high as it needed to be, and when I swapped feet to try and find something a bit more doable with my left foot, the right one got wedged into where it was, and I thought I might become a permanent fixture; one more thing for everyone to have to climb over on their way to the top. Eventually, about the time Jimmy was offering to get out his pocketknife and hack it off, I managed to wiggle the foot free. Paddy more or less hauled me up from that point. Yet another keen display of grace and elegance. 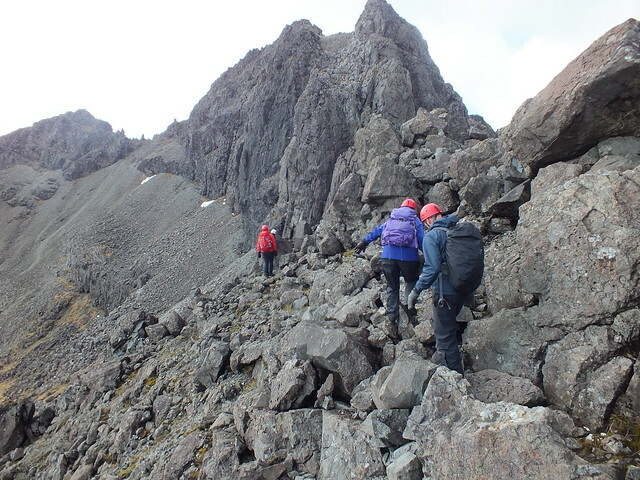 We passed by the top of Sgurr Alisdair, paid our respects to the highest point on Skye, and made our way back down to the ridge, to the top of the Great Stone Chute. 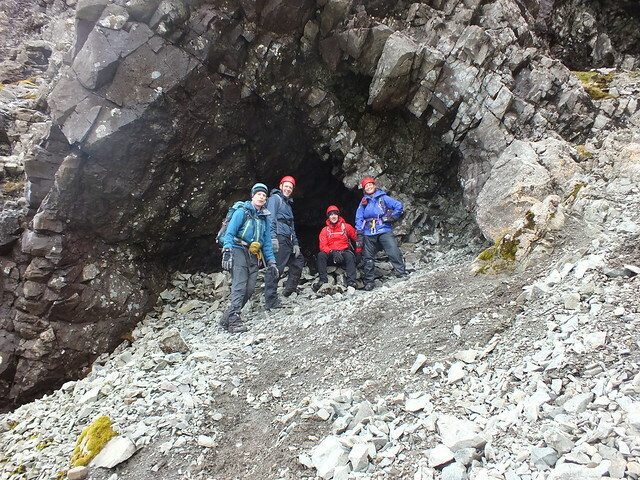 Three summits, the most we’d done during a single day, and probably two more than we thought we’d manage at the outset. I won’t speak for the others, but I was feeling pretty darn good. All that was left to do was to get down. 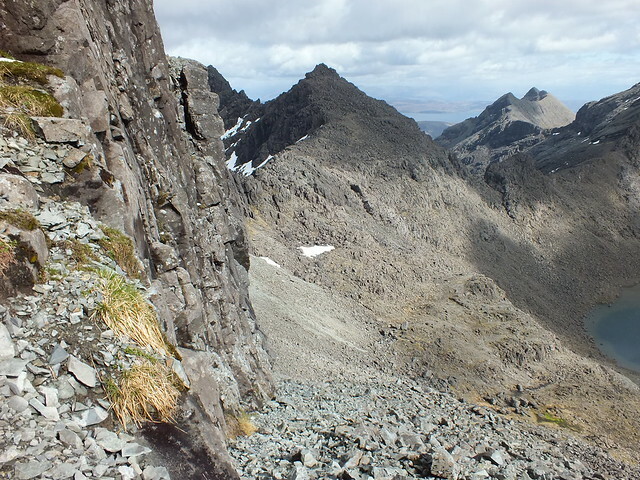 A couple of days earlier, coming down off of Banachdich, I’d had a rather large epiphany about descending steep and scrabbly scree: the more I was able to relax my legs, slide over the top of the surface, and use my arms for a bit of balance, the easier it was. 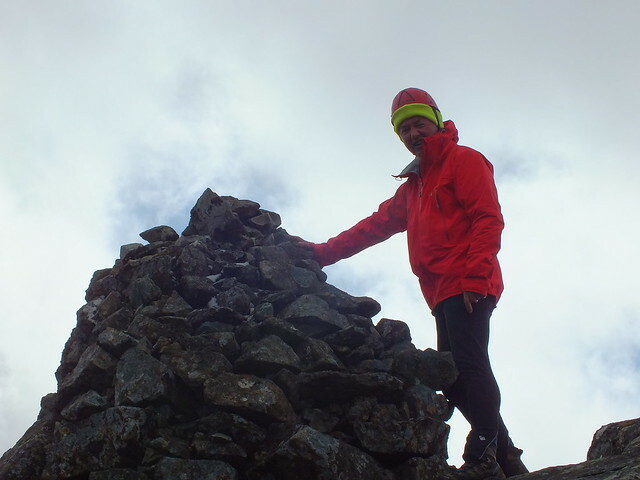 I managed that one all the way down without falling, and in record time (for me); the sense of accomplishment for that was almost greater than for the summit itself. 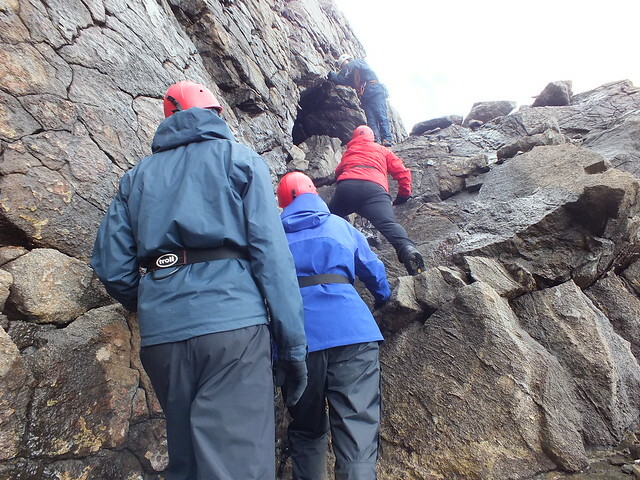 However, the stone chute had a lesson or two in store. 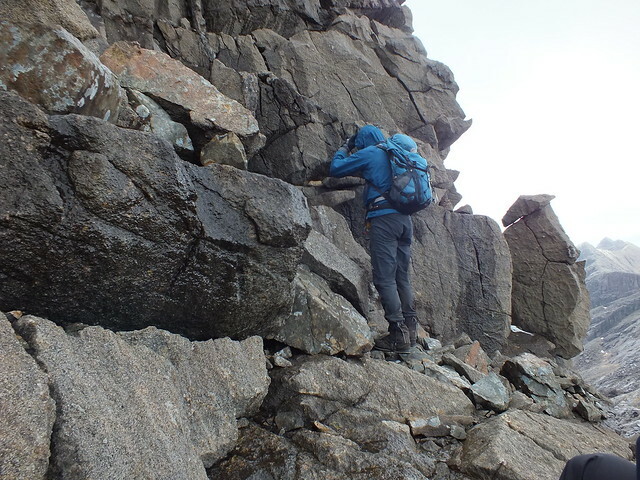 As we dropped down off the ridge, my summit euphoria quickly dissipated as the distance and amount of effort it was going to take to get down became evident. The skill I thought I might have figured out a few days previous had abandoned me; tired legs could neither balance nor relax, and when I fell, I couldn’t gain purchase with my feet to get up again. 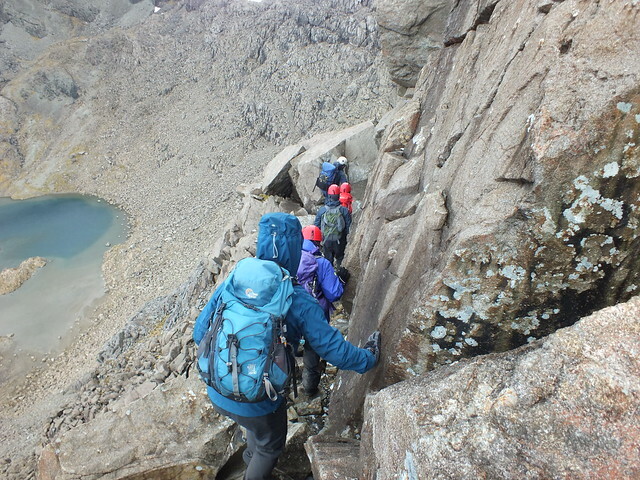 About three-quarters of the way down, with Paddy, Martin, and Andy still looking like very small specks at the bottom, and Jimmy and Simon behind me, after falling for the umpteenth time, I admit to having a bit of a strop. I’m not sure how I thought it might improve the situation. Sorry, guys, for the childish display of temper. The only excuse I can make for myself is the frustration and exhaustion that held me firmly in tow. It was pretty much like this all the way down! 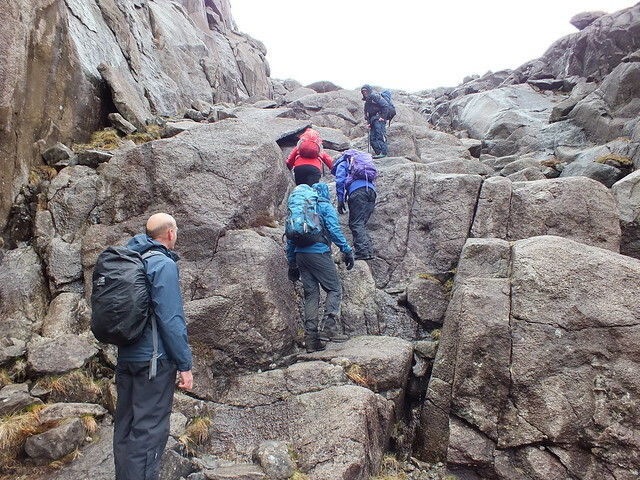 Great relief to reach Coire Lagan! 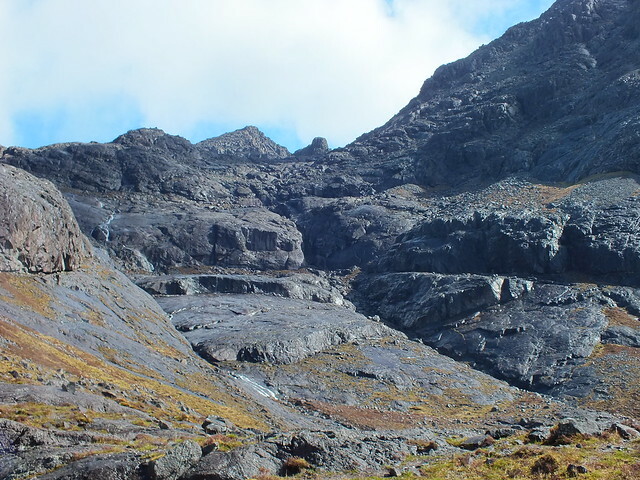 Once I finally reached the patiently (at least on the outside) waiting gentlemen, we dropped down out of Coire Lagan, and the rest of the walk back to the campsite was on a good path and without incident. Some awareness of my wider surroundings returning, I do remember that it was a nice evening. We returned to the start point just before 8pm, after nearly 11 hours. 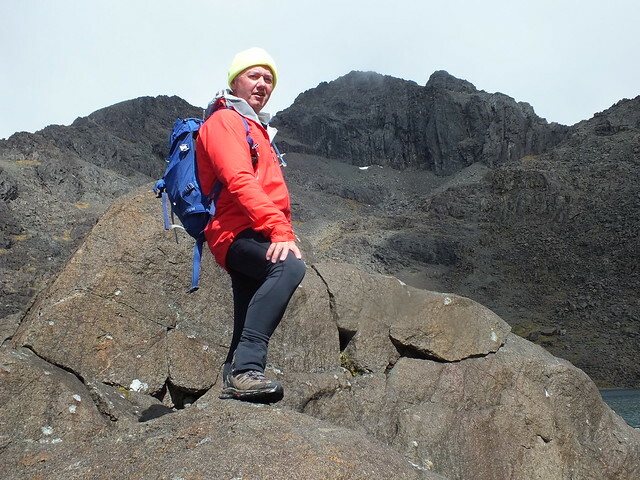 It’s by far the most demanding day, both physically and mentally, that I’ve had in the Scottish hills to date. 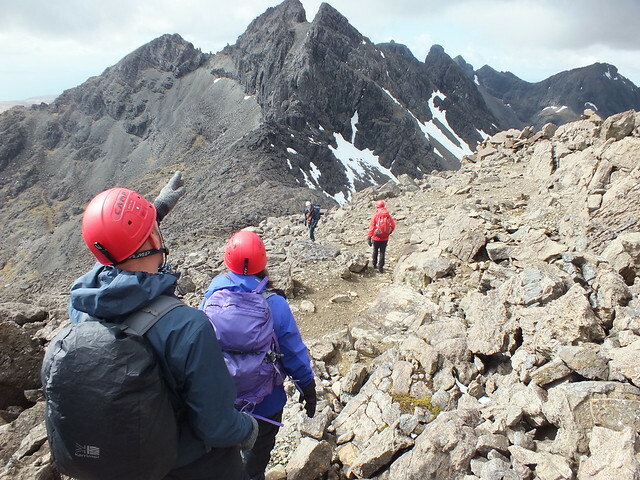 Thus endeth the (first) Great Skye Adventure, so many months in the making and anticipation. What a superb and memorable time it was. Overall, I was less scared, and less often, than I thought I’d be. I have to give a quick shout to Kevin29035 for some of this; in a recent discussion on WH about scrambling grades, he was waxing philosophical about the difference between worrying about what’s right in front of you, versus being scared about the entire endeavour from the time you leave the car (or even before that, in my case). It’s very good advice—for life in general in fact—that I’m trying to take to heart. Paddy was excellent: his calm demeanour put me at ease, and he had a real knack for knowing when to instruct, when to just watch, and when I was going to need a bit of extra help. OK, here comes *my* closing speech. Martin, Simon, Jimmy, Andy, thanks for the laughs and support and everything else. I think we’ve done ourselves proud. A special thanks to Simon for getting the ball rolling by booking with Paddy, and for offering me the opportunity to join in. I’m a bit of a word nerd, and as we’d had several conversations about words and language throughout the week, I'd suggested that everyone come up with a word or phrase to sum up either the final day, or that could be applied to the entire trip. I disallowed “adventure,” “awesome,” and “epic.” With Jimmy and Martin heading home directly off the hill that night, we didn’t have our usual post-walk debrief over a beer or six, so I didn’t get a chance to collect everyone’s final contribution (feel free to add them here), but I did hear a few thoughts as the day unfolded. Andy immediately said “eclectic.” Paddy’s was “November-ish” with regards to the weather we’d been treated to. Simon said “cragginess” at one point, and Jimmy mentioned “supercalifragilisticexpialidocious,” but I think he just wanted to see if l could spell it. The compound word I'd chosen applied more to the entire trip than only the final day. I didn’t want to say it aloud, for fear of tempting fate, and after my trial in descending the stone chute, I did consider changing it. 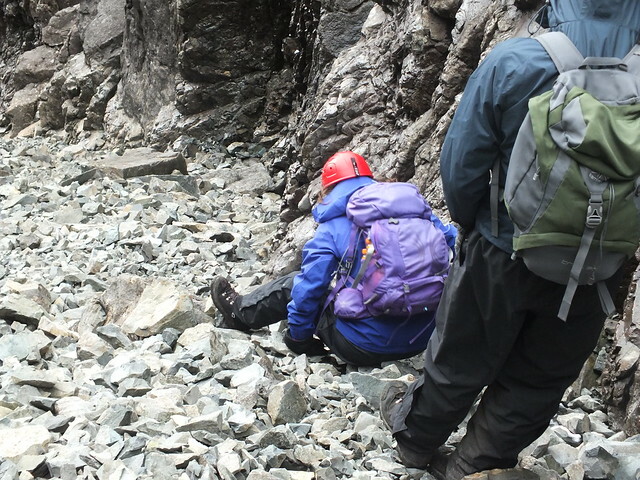 But that incident was only one small amount of time, relatively, over the course of a multi-day adventure (oops!) during which I found myself clambering up, down, and over rocks, crags, and gullies, standing on top of one or two of the pointiest, scariest hills that Scotland has on offer (ok, in truth, it’s more likely that I was either sitting on it, or had my arms wrapped around the nearest big rock), dodging falling rocks from above, and skiing down a scree slope with the grace of a gazelle ( bit of poetic license there). Even a year ago, I could never have imagined that I’d want or be able to do any such things. I loved almost every damn minute of it. It’s been one of the most confidence-building experiences of my life. Mum, I’m home safe; helmet #4 signing off. Last edited by kmai1961 on Mon May 23, 2016 5:19 am, edited 3 times in total. 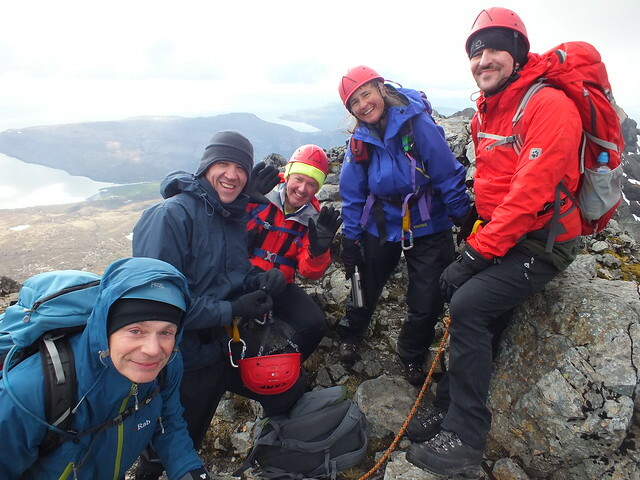 Re: Skye day 5, what a finish! Excellent stuff and great report now you all know you will Compleat, which must make you all extremely happy. Superb photographs as well! superb - have really enjoyed the whole series from you guys. 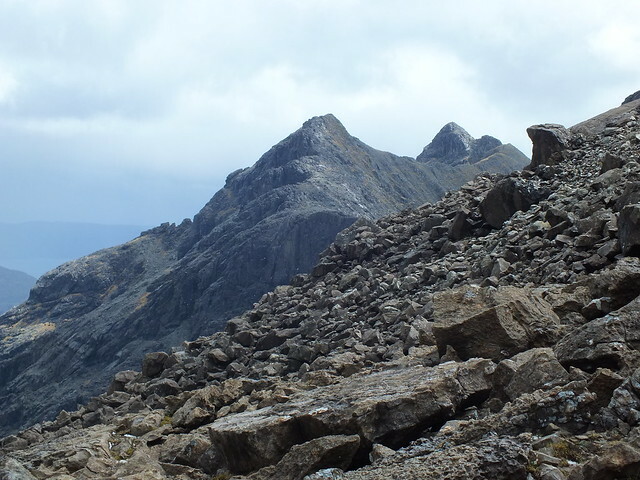 Fantastic write up to finish the epic saga of your week on Skye. Amazing trip, one that will no doubt stay in the memory a long time. I did pretty much the same route years ago. Its pretty much a blur to me too! Enjoyed reading that, Karen - despite the weather it's been a productive week for you all. 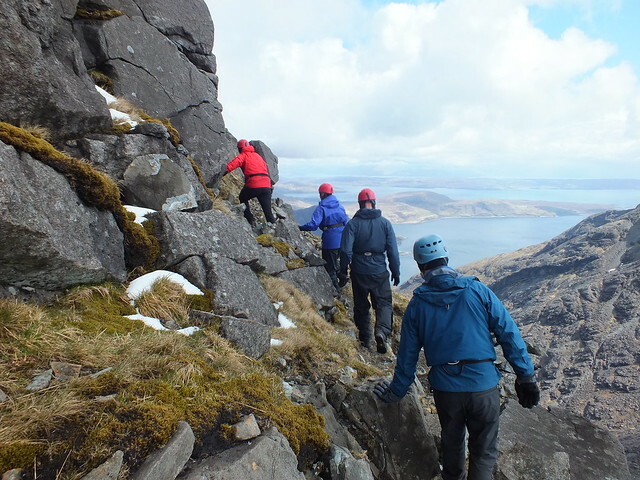 Photos illustrate the different parts of the outing well, bringing back some memories for me - we did Dubh & Eag in fantastic weather and Alastair in dreadful conditions. Well done to all of you for battling on through a poor week of weather. 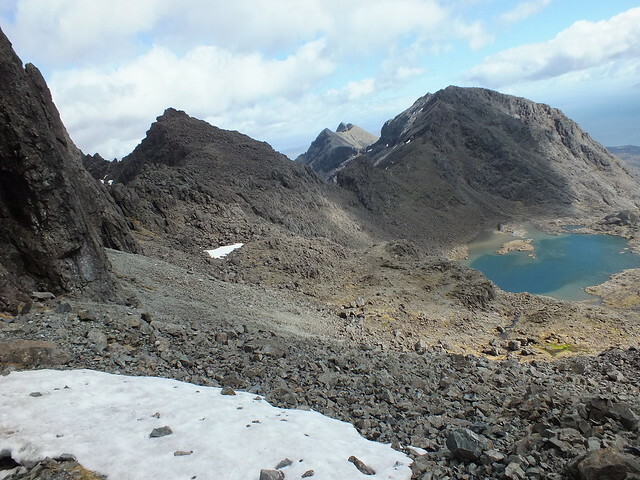 Having been through a warm up climb myself on the Rum Cullins and reading your reports, I think I might now swap my week on Skye for a sunny beach and good book!! Fantastic report, Karen. So sorry you didn't get the amazing views but you obviously enjoyed yourselves in any case. 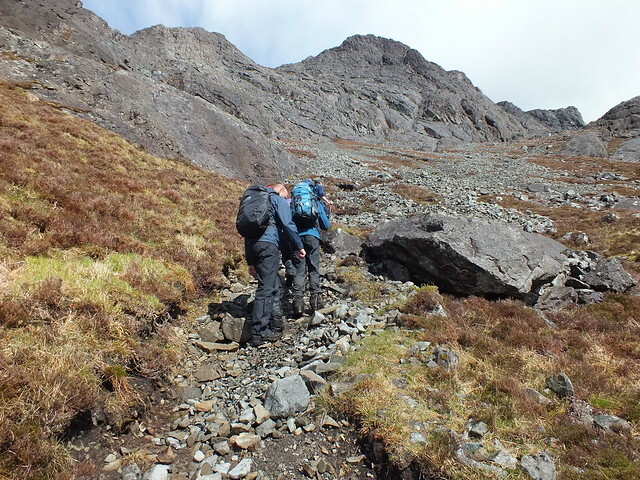 Pleased you articulated so well the problem for those of us who are blessed with shorter legs (I'm 5ft 2in) how difficult it is to haul ourselves up some of the scrambley routes. I have the same difficulty and I know it stops me from doing things that I certainly have the will to do. Good to hear it from someone else too. 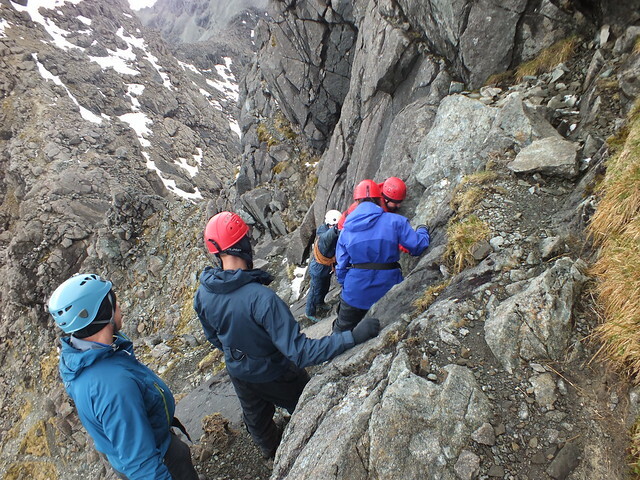 Also, thanks for being so honest and courageous about the Stone Chute on Sgurr Alasdair. It's on my list and I 'd have to go up and down it so maybe I'll rethink that one! Hats off to you guys! a massive day like that after all those previous days on the hill. You're made of tough stuff!! You go girl! Well done! 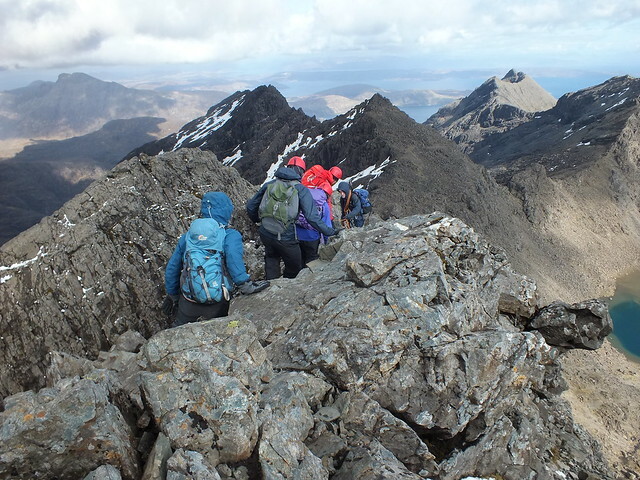 Superb account of our last day on Skye, Karen. 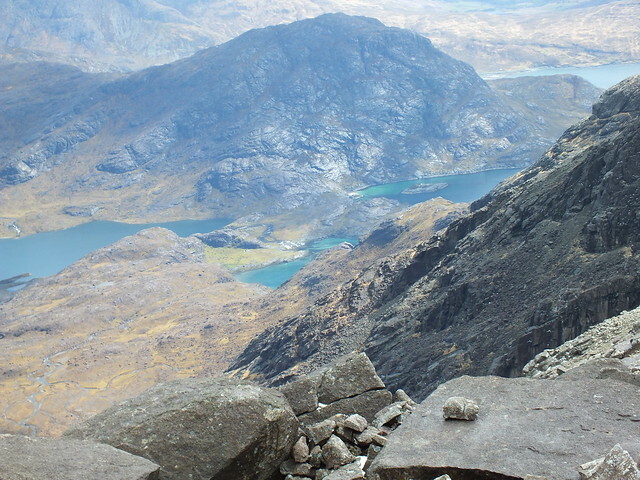 It was great to get the view down to Loch Coruisk at last, and the panorama from Alasdair was amazing. Just read all five in sequence - been saving them up - and thoroughly enjoyed the narrative you have shared with us all. Humour, fear, achievement, challenge, and yes, even confidence-building: the word-fest spews out. But Karen, as you'd expect from an earlier conversation, I'm going to be a pedant. Does a hyphen make it one word or is it still two? I know, from crafty experience and needing to reduce the word-count on various pieces, that adding a hyphen in Word does make it one word: although I'm not convinced. However, full marks for the apostrophes - and even more for surviving and yet enjoying the atrocious weather you were all dealt. I believe the concept of counting hyphenated words as one word rather than two originates from newspaper and magazine editors wanting to reduce the payments to freelance writers. Savvy lot, clearly. Thanks, everyone, for all the lovely comments. I'm a bit overwhelmed by them! Ah, eagle-eye Nigel, woe betide me that Hope-ful conversation about editing. I've amended the report to read instead "My compound word..."; will that do?